Candidates may be banned from campaigning in the Pop-Up Village during the 2017 ANUSA elections. Students will vote on the proposal at ANUSA’s Annual General Meeting this week. This change follows last year’s exclusion of Union Court thoroughfares for campaigning. 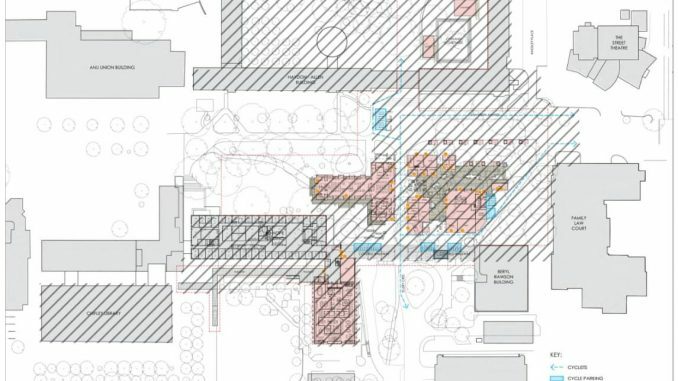 The proposed exclusion zone, shown below, includes the entirety of the Pop-Up Village, the Copland Courtyard and surrounding buildings, Chifley Library; and a significant portion of University Avenue. 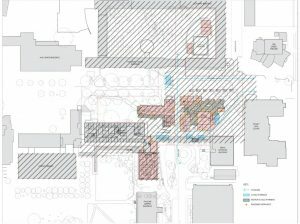 The exclusion zone, proposed by ANUSA General Secretary Kat Reed, allows a student to walk from Copland to Chifley without ever needing to encounter a campaigner, as well as all the shops and venues in the Pop-Up Village. Campaigners, it is intended, will largely occupy the tree-lined area of Union Avenue west of the Pop-Up village. That area is currently a major thoroughfare, and was off-limits in the last election. However, during this year’s ANUSA election, everything west of that space will be sealed off and demolished for the Union Court Redevelopment, rendering it an essential dead end, and students coming from across Sullivan’s Creek to Copland will need to walk around the back of Chifley and through the Pop-Up, the areas excluded by these changes. Another likely campaign point is the lawns between Chifley and the Baldessin Precinct, where many students will likely walk to and from the Pop-Up village. Exclusion zones block campaigners from speaking to students in the zone, openly wearing campaign materials, placing posters, or in any other way advocating that students vote for them. The zones would be enforced by the Probity Officers, independent arbiters responsible for monitoring ANUSA’s elections. ANUSA President James Connolly said the exclusion is due to “accessibility concerns and concern for the Association’s reputation”. In 2015, former Disabilities Officer Tom Kesina brought the issue of accessibility to the forefront, and advocated for exclusion zones, highlighting that students with anxiety and various other issues found being approached constantly by campaigners uncomfortable or difficult. Former candidate Dom Cradick argued exclusion zones are bad for democracy, and inherently ideological. “Face-to-face interactions are a vital part of grassroots democracy,” Cradick said. He argued that an exclusion zone “shifts the balance away from grassroots, volunteer campaigning to paid online advertising” and so is a politically biased proposal which benefits “less activist” tickets. Connolly and Reed are not running in the next election. Whether campaigners are allowed in the Village will be decided by ANUSA’s Annual General Meeting this Friday, which all undergraduate students can attend and vote at. The changes are expected to pass: last year’s proposal succeeded with a large majority. The ANUSA elections will be held late in Term 3. The proposed exclusion zone, shown by the shaded area.